When I was first put in a position of supervising others, I received no formal training in leadership. I had excelled as a teacher, and a natural progression was to move into an administrative position. I made a lot of mistakes as I tried to discover the best ways to motivate and empower people to give their best effort. This is not unique to the field of education. Many outstanding individual performers – whether it’s in sales, engineering or accounting – are often promoted to supervisor or manager because of their technical expertise. The problem is, in far too many cases, they aren't adequately prepared to lead others. They know how to complete the technical aspects of their work, but they have no clue how to help those now in their charge to become outstanding, too. 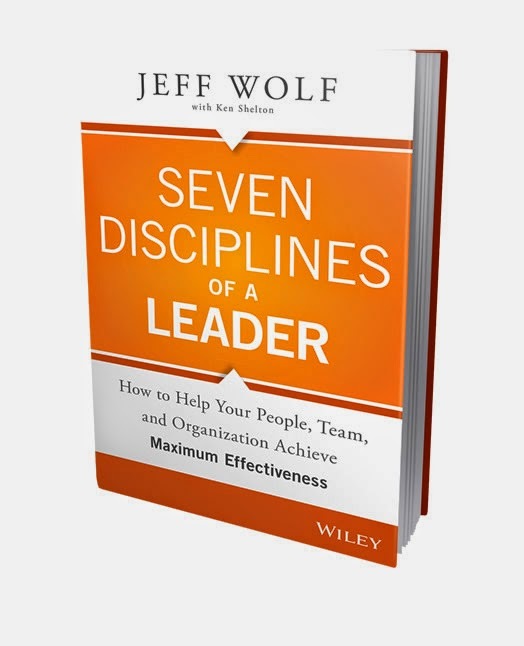 I wish I’d had Jeff Wolf’s new book, Seven Disciplines of a Leader: How to Help Your People, Team, and Organization Achieve Maximum Effectiveness when I got promoted. There’s no shortage of books on the topic of leadership. But many are theoretical and don’t give specific “how-to” advice. You can learn about leadership, but you don’t get a clear roadmap for exactly what to do. Seven Disciplines provides those kinds of specifics…and so much more. Jeff Wolf’s advice is credible and practical because he draws from his own experience as a senior executive and his decades of work coaching hundreds of leaders in all kinds of industries. The client stories he shares throughout the book bring each of the 7 disciplines to life. These disciplines as well 11 related practices can be developed and applied whether you’re a leader in the workplace, a volunteer organization, or a professional association. The skills carry over into effective parenting, too. Jeff serves as your personal coach for leadership development. That’s because of the book’s structure. You can select a chapter that deals with a skill you want to develop. You’ll find out what to do and how to do it, with real-life examples. And then he guides you to take action steps through a “Takeaway” section. He also tells you the truth about what’s required to actually change your behavior. With his Daily Discipline Activities, you schedule 30 minutes each day to focus and practice that one skill until it becomes a habit. Based on our company's experience with clients during the past 25 years, I believe his advice is spot-on. Whether you’re a novice or veteran leader, you can use Seven Disciplines of a Leader as a blueprint for your development. If you follow the specific guidelines and complete the thought-provoking exercises, you’ll become more conscious of the behaviors required to inspire others to do their best work.